Elections for Newcastle City Council are due to be held on 2 May 2019. As with last year we’re keen to find out how the candidates propose to address transport-related issues in our community. To do that we’ve come up with five statements or pledges and we have asked each of the candidates whether they support these or if not what they plan to do instead. These are the same as we used for 2018 and you can see candidate’s responses from the 2018 Local Elections here. Please keep checking back in advance of the elections on 2 May and if one of your candidates has not yet answered please do encourage them to do so. 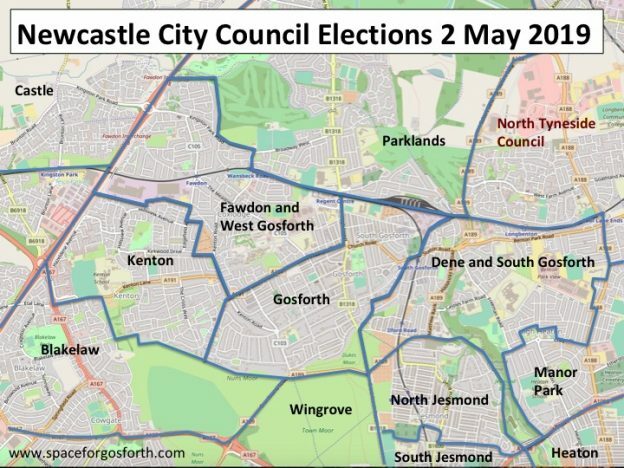 The very least we should expect from future local councillors is a willingness to engage with local residents and share their vision for the future of Gosforth. 1. Streets that are safe (and feel safe) for children to walk and cycle to school, to the shops or to the park. 2. Air pollution in Newcastle brought within legal limits as soon as possible. 3. Residential streets that are pleasant, safe and attractive places to live and where children can play out. 4. Rapid implementation of temporary changes to trial interventions to support these objectives. 5. Constructive community engagement about how to address the public health impacts of travel and the benefits of active travel. Please see below for more on why we have chosen these pledges and what they mean in practice. We have updated this since last year to reflect recent updates on air pollution, what residents think and how trials work, and as part of the first pledge we are also asking candidates to support a bid for Streets for People to be expanded to Gosforth. Candidates are listed in the same order as on the Newcastle City Council local election website. Where a response is shown as a link, please click on the link for further details of the candidates response. Everyone should be able to travel safely whether they walk, cycle, use public transport or drive and should feel safe while they do so, but this isn’t currently the case in Gosforth. Often, traffic is fast and heavy, which is intimidating to many people. In the SPACE for Gosforth Your Streets – Your Views survey, 88% of respondents supported safe walking and cycling routes to schools. Children are less able to look out for themselves and are more likely to be injured or even killed in the event of a collision, so focusing on children, whether travelling independently or with an adult, is a good way to make Gosforth safer for everyone. As part of this pledge we are asking candidates to support a bid for Streets for People to be expanded to Gosforth. In the last official figures from 2017, Gosforth High Street had the highest air pollution reading in Newcastle, substantially higher than the legal limit which should have been met by 2010. 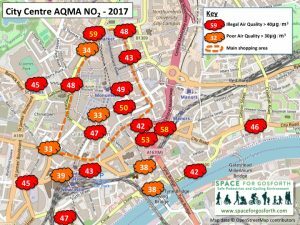 SPACE for Gosforth has set out the many negative health impacts of air pollution including via this recent blog Which works best: Tolls or a Clean Air Zone? Latest estimates are that air pollution is responsible for 64,000 early deaths each year in the UK as well as a wide range of illnesses. As a result of this Public Health crisis, Newcastle City Council has been mandated by DEFRA to produce a plan, which is currently open for consultation. DEFRA has also written to Newcastle City Council threatening legal action if there are any further delays to its plan. This plan must meet legal limits in the shortest possible timescales. In practice this means some sort of road charging is inevitable. The Council can still determine who is charged and how much, as long as its plan is demonstrably likely to meet legal limits by 2021. It can also seek funding for other measures such as grants or loans to upgrade older vehicles. In the SPACE for Gosforth Your Streets – Your Views survey, 85% of respondents supported reducing through traffic on residential streets. Low-traffic neighbourhoods with streets that are safe for children are better for everyone with less noise, less danger and cleaner air. It’s even been shown that people living on streets with less traffic have more friends and a better social life than those that live on streets with heavy traffic. 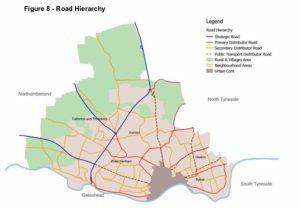 Newcastle City Council Road Hierarchy. If Pledges 1-3 are to mean anything there must be some meaningful and urgent action as a result. One option is to use trial interventions that can be implemented quickly to let residents experience changes before they are made permanent. If there are issues with the scheme, residents can provide feedback and action can be taken with local Councillors to resolve those issues. As well as providing safety benefits earlier than might otherwise be achieved, this removes any guesswork as to what the effects might be and ensures that schemes can be evaluated on their actual merits. Making streets safer and cutting air pollution should be objectives that everyone supports, but it is still important that the council and local councillors engage with the community to ensure that residents understand what the issues are and have a chance to help solve those issues. Air pollution in particular is invisible and we’ve found that many people haven’t been aware that it has been, and continues to be, a problem in Gosforth. Nor are people generally aware of the very serious health impact of sedentary lifestyles which cost taxpayers billions of pounds every year and are responsible for even more early deaths than air pollution. Likewise it is often challenging to put ourselves in others’ shoes, to understand for example what it is like to be a child on Gosforth’s streets, what it is like to be a parent cycling or walking with children (or even alone) on busy streets during the rush hour, or what it is like for residents or visitors with disabilities or conditions for whom travel is a challenge. It is only by having this broad engagement that we can ensure that Gosforth’s streets are safe and accessible for everyone. These five pledges are based on SPACE for Gosforth’s objectives which you can see here. They don’t cover all the SPACE for Gosforth objectives but we welcome input from candidates about how they will go about meeting other aspects of those objectives to make streets in Gosforth more healthy, liveable, accessible and safe for everyone of all ages and abilities. If you don’t live in Gosforth please feel free to ask your local candidates to support these pledges as well. We know very well that Gosforth isn’t the only area that suffers from these issues. You can follow SPACE for Gosforth on Facebook or Twitter. If you support the SPACE for Gosforth objectives please do join us. Information about how to join SPACE for Gosforth is here.